As the popularity of the Grateful Dead grew in the early 1970’s the band found themselves perpetual road dogs in an attempt to make up for lost ground after Mickey Hart’s father, Lenny, absconded with $155,000 of the band’s savings leaving the band financially in shambles. 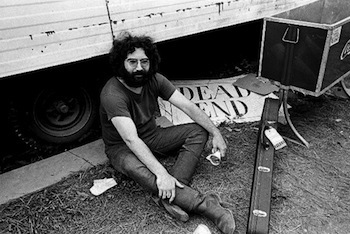 The Dead soon found themselves moving away from intimate theaters and halls to performing in large arenas and stadiums. With the added pressure of pleasing their amassing fanbase came the need to sound better in these larger spaces – a need which soon yielded the creation of the infamous Wall of Sound. The two separate 75-ton walls not only provided the band with a distortion free sound system, but also worked as its own monitoring system and came equipped with four semi-trailers and a 21 person crew. The endeavor was not only challenging logistically, but financially. It soon reached the point where the band could no longer earn enough to keep the behemoth afloat. So as 1974 came to a close the band quietly went on hiatus as Garcia slipped out the back door of the band’s last show at Winterland to gig with a new set of musicians. Garcia’s desire to play music outside the context of the Grateful Dead began as early as 1969 with the creation of country-rock pioneers New Riders of the Purple Sage. Almost simultaneously, in the spring of 1970, he began to take part in loose jam sessions with organist Howard Wales at the San Francisco musician’s clubhouse, The Matrix. Wales soon left the fold and was replaced by seasoned Bay Area jazz and R&B vet, Merl Saunders, who brought a funky repertoire to the table that paired well with various R&B and rock covers sung by Garcia. By early 1971 the group had an semi-official name – The Garcia-Saunders Group – and was rounded out with bassist John Kahn, drummer Bill Vitt and the later addition of tenor saxophonist Martin Fierro. During the early months of 1974, Vitt exited the group and was replaced by a revolving door of drummers including the Dead’s own Bill Kreutzmann and the in-demand session drummer Paul Humphrey, who kept the drum throne warm for Elvis’ drummer, Ron Tutt. Tutt joined the group just in time for a spirited holiday run up and down the West Coast — where we find the band at the University of Oregon’s EMU Ballroom on December 15th. The mood surrounding the gig is low key – Garcia’s playing sounds inspired and youthful paired with Saunder’s driving organ and husky vocals. Early in the set Garcia takes the reins for a version of Alton Joseph Valier’s cajun-inflected ‘Neighbor, Neighbor’. Valier’s song was a hit single for Jimmy Hughes in 1966 and fittingly the lyrics (‘Neighbor, neighbor don’t you worry what goes on in my home. You’re always looking for something to gossip about’) line up with where Garcia’s headspace possibly was at that time (see: aforementioned hiatus). Right off the bat Garcia’s leads are punchy and hard-driving as the rhythm section lays a thick pastiche of notes that are equal parts dirty, soulful, R&B and jazz-funk. Saunders organ riffs hit incendiary notes that purposefully set small fires for Garcia to weave in and out of as he grinds it on home. Out today, Garcia Live: Volume Three documents Legion of Mary’s 1974 Pacific Northwest tour. Ironically enough, it is from this dated in 1976, that Mickey Hart first played He’s Gone with the Dead. Legion of Mary was always some of those mystic tapes that you’d get in collection. There weren’t much of them floating around that were a quality worth listening to. I’m pumped for this. Hope that they release more stuff from this time and also from 1975, when the Dead was on hiatus. Who helped Jerry increase his musical vocabulary. Here is one I did with Howard Wales.